January 9, 2015 is a day our family will never forget. Today our son, Carter got the gift of hearing. You & I take this for granted but when you see a smile on a child's face who has heard sounds for the first time it's an amazing feeling. 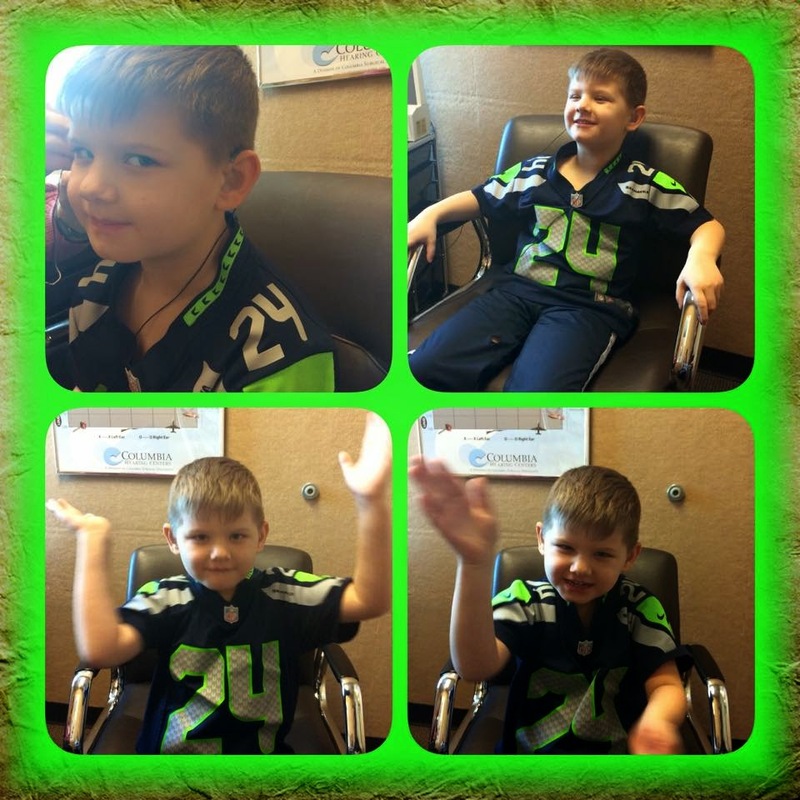 Carter's hearing aids are Seattle Seahawks colors which he is so very proud of. In this picture you can see he's clapping and making sounds and just taking it all in. Carter (age 5) has been slow with his speech & drops a lot of the S, Th, Ch sounds. We always suspected something was not right but each pediatric visit they reassured me that he was fine. Finally when he had his kindergarten shots I said to the pediatrician I am really concerned with his speech. He barley just started speaking if full sentences and kindergarten is around the corner. So I paid to take him to a speech therapist who again reassured me that his speech was fine. Then in kindergarten this year Central Valley School District (CVSD) did a hearing test & he failed 2x. We took him in for a hearing test & we were told he has only 60% hearing. So he now has the hearing aids and speech therapy will follow. I guess the lesson for me was to be more persistent. I let doctors tell me for 3 years that his delayed speech was ok. The speech delay was a direct reaction to his hearing loss. My husband and I are so thankful today for AMAZING health insurance (hearing aids aren't cheap) and to CVSD for finding out about his hearing & the BEST part seeing the joy in Carter when he can hear. You and I might think he is different now because he has hearing aids, but in his eyes he's normal now because he can hear like you and me. Friday at school was a bit of a learning curve. I think we discovered we need to lower the volume. When the kids were in line and being loud, like kids are, the painful look on Carter's face was telling enough that there needed to be an adjustment. He also asked the kids to be quit but they didn't. He wore them on and off on Friday because we were in a large gym with lots of noise and then at the restaurant he took them off again, saying there too loud. Saturday morning we tried it again but same thing they were too loud so we will have to get them adjusted at the audiologist because the hearing aids are basically a computer in your ear. Hopefully we can get in quickly to get them adjusted so he can wear them and get use to them.